As part of this initiative, we organized periyAzhwAr thirunakshathram celebrations on June 27th. 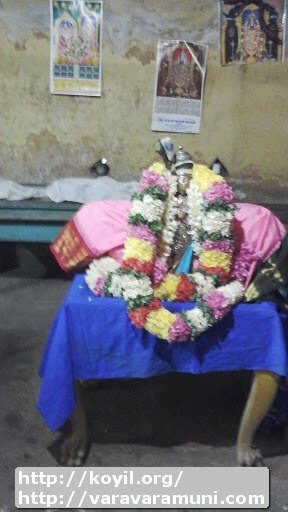 (rettai pAsurams) and upadhEsa raththina mAlai (rettai pAsurams) were recited. periyAzhwAr and vadakkuth thiruvIdhip piLLai vAzhi thirunAmas were also recited. thIrtham, prasAdham were distributed to all the assembled persons. Full set of pictures at https://plus.google.com/photos/107723698299182214927/albums/6165013907261626113 - Thanks to T N Krishnan swamy for the pictures. Many thanks to Raghuram swamy, T N Krishnan swamy and M R Sriram swamy for co-ordinating the celebrations. We also thank our donors for their financial contributions for this noble cause. Thanks to the archakas, parichAraks and trustees for facilitating this kainkaryam.